Free Pattern Fridays - Friday, June 1, 2018, Issue 56: It isn't officially summer yet but is it hot enough for you? It is only the beginning of June...The days are already hot and humid but I have air conditioning!! 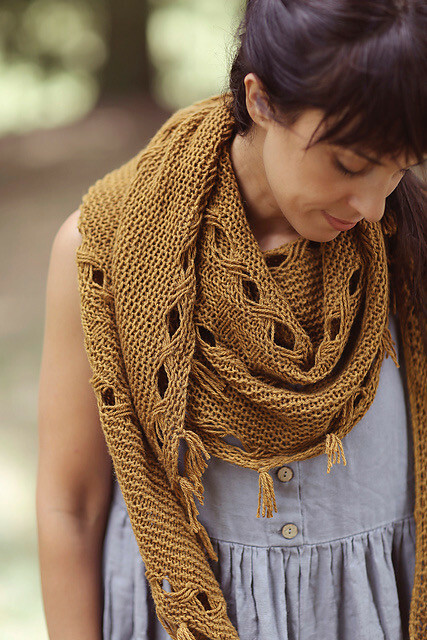 Are you summer knitting or are you knitting for next fall? Do you set down their needles to work in your garden, go camping or the beach or a myriad of summer activities? 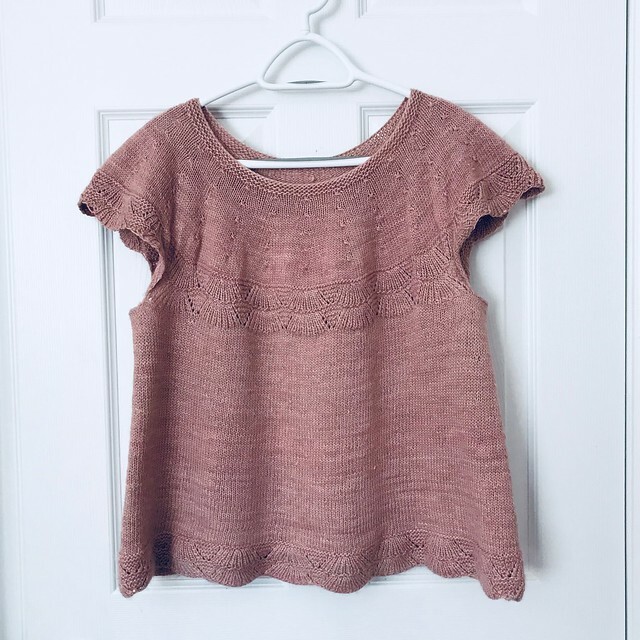 I knit year round and cannot imagine having my hands being idle so I still knit during the summer months and I love summer tops - lacy or plain, tank top style, tee shirt style like Morning Sky by Heidi Kirrmaier that is fresh off my needles! 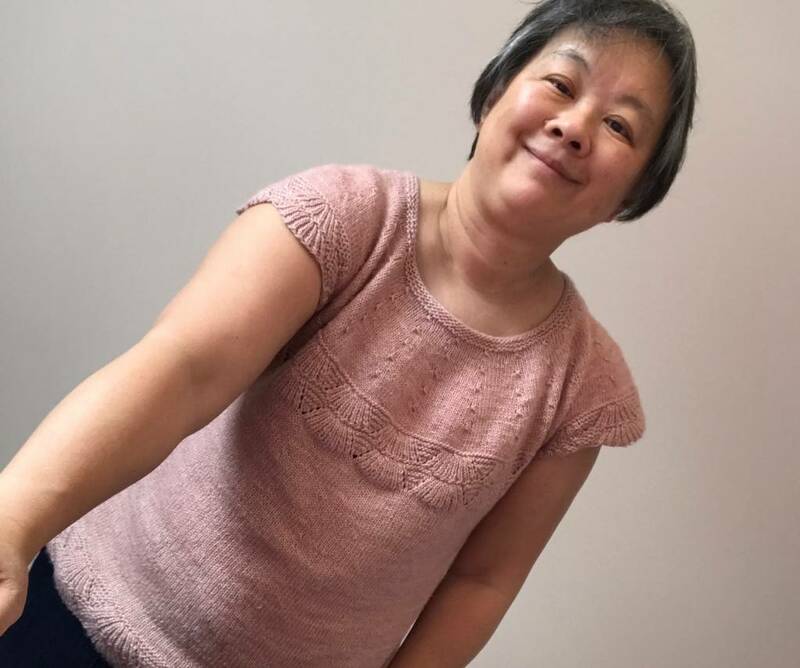 Pink Onyx by Ayako Monier is a pretty summer top knit seamlessly topdown with raglan seams, featuring open lace, vertical waist shape darts and the cute cables on the sides. Knit it using 3.75 mm (US 5) and 4.00 mm (US 6) needles with a DK weight yarn for a gauge of 20 stitches and 26 rows = 4 inches in stockinette stitch with the smaller needles. 178-45 Orange Dream by Drops Design is knitted top down with raglan, lace pattern on yoke and an a-line shape. Knit it with a sport weight yarn with 3.0 mm (US 2.5) and 2.5 mm (US 1.5) needles for a gauge of 24 stitches and 32 rows = 4 inches in stockinette on the larger needles. 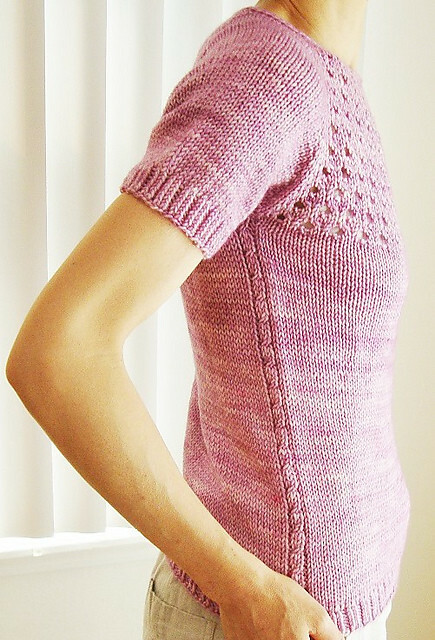 Drops Design also has a long sleeved version and a cardigan version of the pattern. Knit it with Hikoo Cobasi at a looser gauge or Cobasi DK at a tighter gauge for an summer top that is light as air and soft as butter! 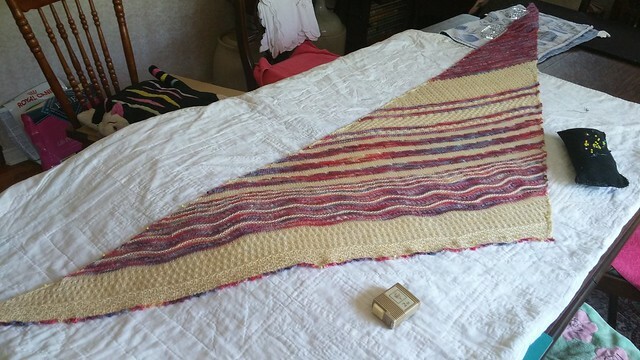 My Morning Sky by Heidi Kirrmaier is off my needles, washed and blocked! I love how it fits and how it turned out especially like the yarn that I chose to use. I liked it so much that I am once again using it for my next project! 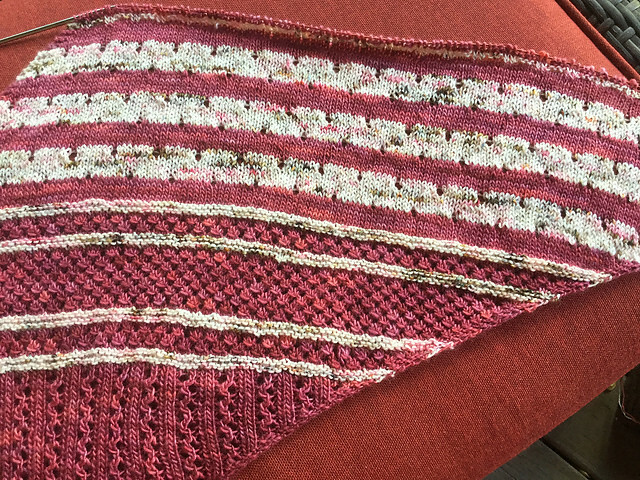 I cast on Joji Locatelli's Hipster Shawl on Tuesday after frogging my first attempt at Fil Katia's Ibis top which I had modified to knit in the round but ended up being the wrong size! I will cast on again but knit the smaller size! For my Hipster, I cast on with Manos Milo in their Savana colourway and it has been fun to knit. I really had a hard time deciding because everyone at Tuesday's Knit Afternoon had suggestions about the colour. 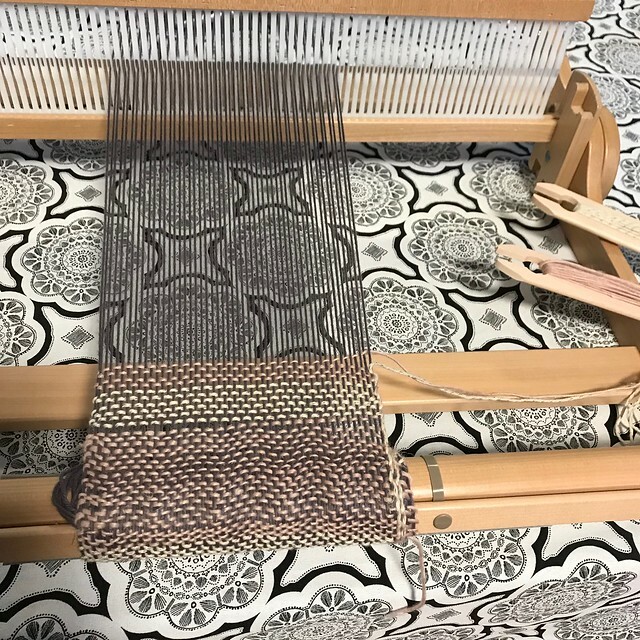 I had intended to use a worsted weight wool as the pattern calls for - there is a lot to choose from but public opinion prevailed and I went with their choice! 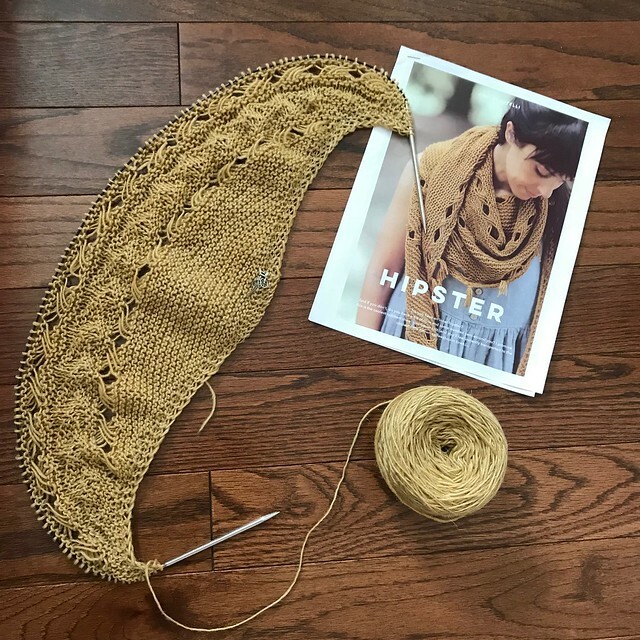 Isn't Joji Locatelli’s Hipster Shawl gorgeous? I had to cast this one on as soon as I saw it! 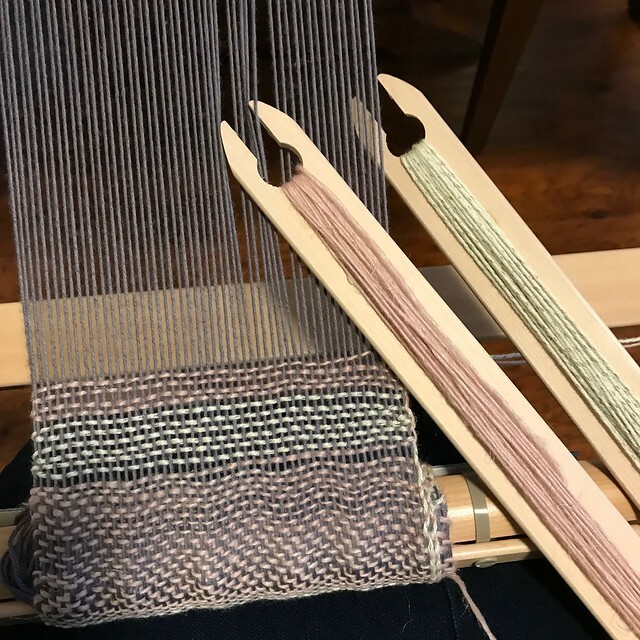 I finally started weaving on my Ashford Knitter’s Loom! I am weaving with the Manos Milo left over from my Morning Sky and Cascade Sunseeker left over from the Soft Lace Chemo Hat that I knit for Melissa. 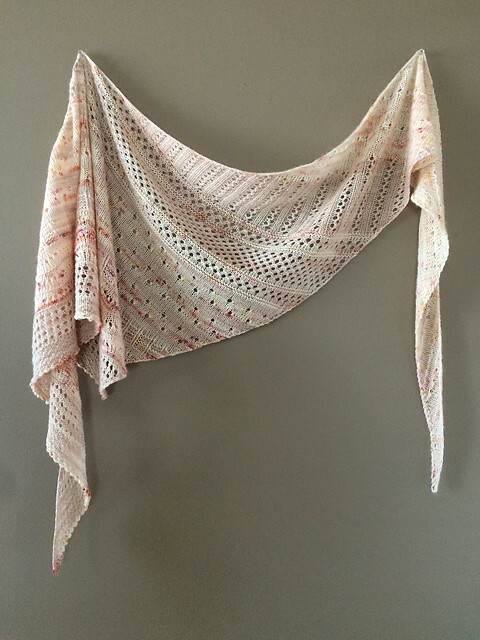 Casapinka's Local Yarn Shawl has been a huge hit! It is being knit by so many of you and yet they are so beautiful and different from the other - each with it's own personality. 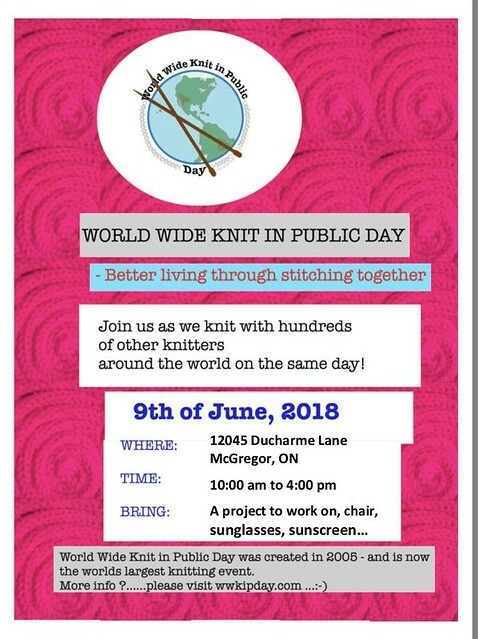 Sue2Knits KIP - World Wide Knit in Public Day 2018. Mark your calendar and join in the fun and meet other knitters and crafters for fibre fun! Any project to work on. I do have folding chairs but you can bring your own, sunglasses, sunscreen and water. I will have coffee, tea, water and some goodies but it has been decided that this will be a potluck so bring something to share and we'll have a party! If it rains or gets too hot, we will move into the shop! 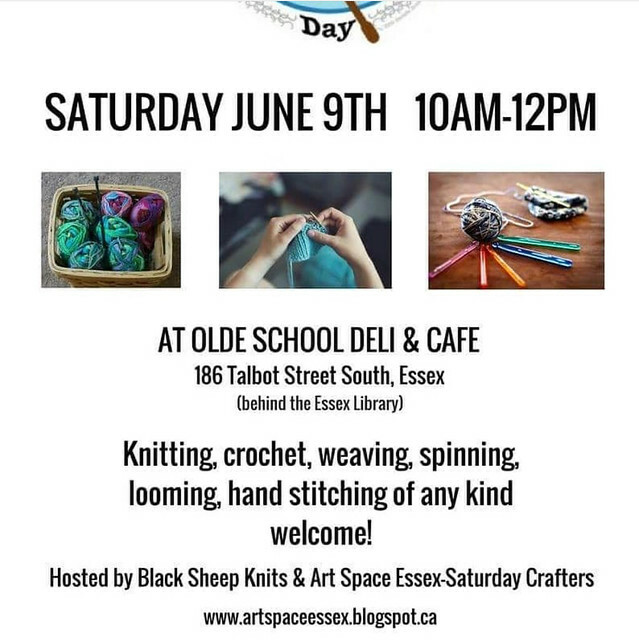 We will have giveaways throughout the day for those who participate in either the Knit in Public event here or the one hosted by Art Space Essex! If anyone is looking for a used chunky gauge knitting machine, Sandi at 519-790-9968 has one that she is selling for $250. It is a Toyota/Elna knitting machine - ER2350 is the model (9mm ribber). She wasn't sure of all the model numbers of the parts but she is including the knitting machine, ribber, stand, punch card and all of the parts and manuals. Give her a call if you are interested since she is moving in 3 weeks and can't bring it with her. Sorry but I don't have any photos of it!